Cancer immunotherapy is emerging as the most promising novel strategy for cancer treatment. Cancer immunotherapy is broadly categorized into three forms: immune checkpoint modulation, adoptive cell transfer, and cancer vaccine. Immune checkpoint blockade is demonstrated as the most clinically effective treatment with low immune-related adverse events (irAE). Blockade of PD-1/PD-L1 and CTLA-4 has achieved remarkable success in treating various types of tumors, which sparks great interests in this therapeutic strategy and expands the role of immune checkpoint blockade in treating tumors including breast cancer. Based on the notable results obtained from clinical trials, the United States’ Food and Drug Administration (FDA) has approved multiple CTLA-4 monoclonal antibodies as well as the PD-1/PD-L1 monoclonal antibodies for treatment of different types of tumors. The theories of immunoediting, T-cell exhaustions, and co-stimulatory/co-inhibitory pathways are immunological foundations for immune checkpoint blockade therapy. 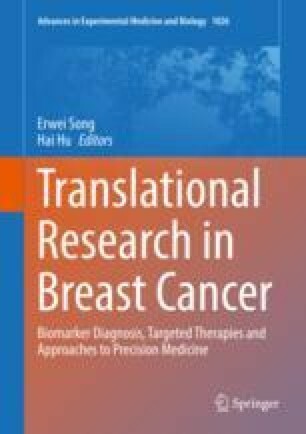 Breast cancers such as triple negative breast cancer and HER-2 negative breast cancer respond to immune checkpoint blockade therapy due to their high immunogenicity. PD-1/PD-L1 blockade has just received FDA approval as a standard cancer therapy for solid tumors such as breast cancer. Development of immune checkpoint blockade focuses on two directions: one is to identify proper biomarkers of immune checkpoint blockade in breast cancer, and the other is to combine therapies with PD-1/PD-L1 blockade antibodies to achieve optimal clinical outcomes.